IT Support Engineer CV example and template. Amend as suitable and write your own CV in seconds. After amending the CV you can start using it for your job applications. IT Support Engineer job vacancies can be found on the job sites online and you can visit them today and start searching for current vacancies. If you think you are good at computers and able to fix them when necessary then this job can be just right for you. You may also need to write a covering letter to go along with your CV. Click here to view latest cover letter examples. If you have any questions about your career then you can visit our job forum today! Ben Andrews: IT Support Engineer. I am a self-professed geek. I love technology and computers. I have a very analytical brain so find it very easy to discover the cause of a problem, and fix it fast. I can communicate with all different levels of user so I can often fix problems without needing to be there in person, which can free up time to be better used for all involved. Bachelor Degree in Computer Sciences. Working for this massive airline I was responsible for the maintenance and repair of the computer systems to ensure that passengers weren’t inconvenienced by being unable to check in at the airport, and that baggage didn’t go astray, and flight passes etc. printed correctly. I worked on an on call basis so that if there was a problem at one of the many check in desks we had I could reach it fast. It would often be software based glitches that caused any issue, but occasionally I would have to diagnose and repair hardware faults. IT Support Engineer, Sea Entertainment,London. I worked for Sea in their contact centre where I was responsible for ensuring that support agents systems worked correctly. I would have to regularly install or repair hardware, mostly tower PC’s and network stacks, as well as peripherals such as Phones and fax systems. Working for a large PC store it was my job to ensure that all the display models were working to standard, and also to carry out diagnosis and repair of purchased items within a set time-scale. This could cover a variety of items such as printers, PC and Laptops and cameras. 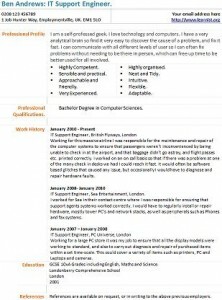 This CV Example cannot be published on any other site without prior permission however you are more than welcome to link to this page.